Today I digged into the GPSGate server install in search of something that's related to the "keep history" thing in GPSGate\cleanup. I want to keep data for 7 years but the dropdown stops at 5 years. Is there a way that I can add 7 years to my GPSGate install? I have a little knowlegde about programming (Visual basic, C++)but I can't find anything. Does somebody know where I have to look? I already searched the forum but I didn't found anything yet. sorry for making this topic. I accidentally found it. It is located in SiteAdmin.aspx source. I think I have to add an option in here. Can somebody confirm if this is the right way? I'm not possible to edit the file. 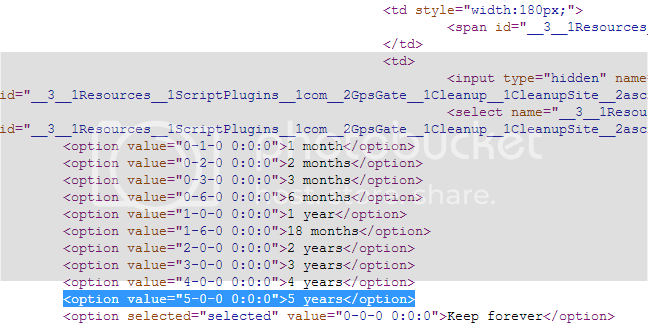 Once I do "inspect element" in Google chrome it shows me the code shown above but when I edit the siteadmin.aspx file it shows me something else. A lot less code as shown in "inspect element". Somebody got any clue? Sorry for bump but I really like to wether it's possible or not. That's very nice! Thanks in advance!